Aucelon is a commune in the department of Drôme, southeastern France. It is found in the Auvergne-Rhône-Alpes region. Aucelon is a village perched at an altitude of 755 meters, towards the center of the mountain rings of Diosis. Aucelon's mountain has a height of 1356 meters. It is located in the south west of Die Tand, extends to the north of the Fourniers, and overlooks the valley of Roanne. The town is watered by the Brette. 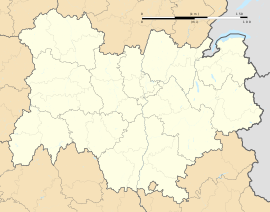 In 1811, the municipality of Aucelon had 466 inhabitants, but the population has been in decline since 1793. Ever since the start of the 20th century, the census of the municipality of Aucelon has had reported less than 10,000 inhabitants. The surveys are held every five years, unlike other cities, which have one every year. Wikimedia Commons has media related to Aucelon. This page was last edited on 19 January 2018, at 22:08 (UTC).